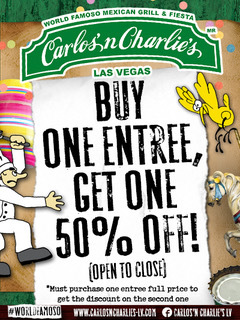 Carlos ‘N Charlies serves authentic Mexican favorites and is a fun hotspot at night. Party spot Carlos ‘N Charlies’s at the Flamingo, serves authentic Mexican favorites in a family friendly atmosphere during the day and then turns into a wildly, fun hotspot at night. From dancing waiters to the dj-driven party and contests, you’re encouraged to let loose until it feels like you’re in Cancun. This casual dining restaurant serves the freshest guacamole on the strip, made tableside to order and is known for their signature Bazooka drink. 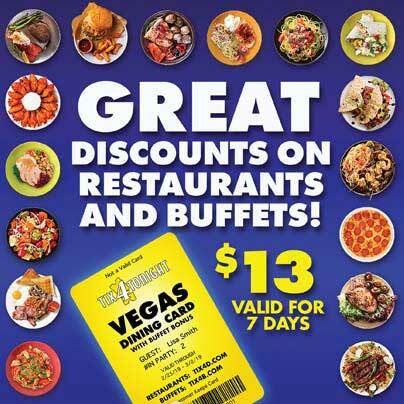 Buy one entrée and get one free with your Tix4Tonight Vegas Dining Card.